How to Distinguish Genuine and Fake Blackberry. Welcome friends Blackberry, present information that this time we will write will review that contains blackberry news Tips and Tricks to buy blackberry. We intentionally wrote the info about the way this blackberry to respond to one blackberry incoming emails from friends that ask about Easy Ways to Distinguish Genuine and Fake Blackberry to blackberry. I am committed to always present the latest and most comprehensive information about blackberry smartphone blackberry one which we will write articles that contains Tips on buying a new bb. Hopefully our humble blog can provide benefits for all blackberry user companions in particular. Below for the full review of present information that contains How to Distinguish Genuine and Fake Blackberry's. How to Distinguish Genuine and Fake Blackberry. In this article I will try tips for you who want to buy a smartphone blackberry or just want to figure out how to differentiate your smartphone blackberry original and fake ones. Like most electronic items more expensive, blackberry smartphone also has a special attraction for lovers of gadgets and smartphone. Not infrequently a lot of people who want to have a smartphone made by RIM's expensive. However, along with his best-selling blackberry sales in the market not guarantee the safety or authenticity of the original smart phone 100%. Yes, the recent rampant fraud smartphone blackberry which is very troubling our society. Current price of blackberry smartphone is priced at a not cheap because it's a lot of parties irresponsible fabricate spare parts even replace it with a fake spare parts not suitable to be used only to increase profits. and illegal, I have some tips that may be very useful for you later. If you buy a blackberry original, blackberry PIN and IMEI listed the dos book. 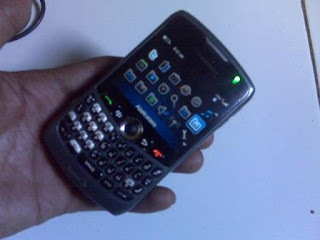 While Black blackberry market (BM) or blackberry fake PIN and IMEI are not listed on Box. this way is the best way to check whether the original blackberry original new or used. Enough to check the Options - Status, and type on the keypad blackberry BUYR. After that will appear Data and Voice Usage. New blackberry should have data and Voice Usage 0. Check stickers and patents blackberry handled there or not. Blackberry Original new or usually has handled patent and blackberry. That's some How to Distinguish Genuine and Fake Blackberry that you can use as a guide before buying a smartphone blackberry. My advice, better to avoid buying a smartphone blackberry second hand you will not know whether the smartphone are in good condition or otherwise. A few tips blackberry How to Distinguish Genuine and Fake Blackberry from me, may be useful. Latest tips 2013, should there be trouble, criticism, or suggestions from blackberry user companions who happened to read the article This, do not ever hesitate to send your comments and suggestions are in the comment section below the article we provide an easy way distinguish between genuine and fake bb's. Suggestions and criticisms of you is an important foundation for us to continue to develop this simple blog to be a container that can always provide benefits for blackberry users on the move. But before you switch on the article How to Distinguish Genuine and Fake Blackberry's, try to listen serving other news from our blackberry to review blackberry tips and other information. Thx so and do not forget the words we say to the readers who have taking the time to review our article entitled from How to Distinguish Genuine and Fake Blackberry. How to Track a Lost Blackberry. This time I will share tips that might be very useful for Your Blackberry smartphone users. Tips or this way contains about how do we track blackberry mobile phone is lost or left behind in somewhere that you forgot. The. Then how to Track a Lost Blackberry effective? To track blackberry smartphone yours or your girlfriend has been lost you do not need to grieve or to report it. The needs you do is think calm and use your brainpower. One of which you can browse on the internet how to track blackberry missing as I write this. If you've come here, so we just headed gist of the article How to Lost Blackberry's track. To keep track of the advanced smartphone such as blackberry, you need to perform some steps that I write down below. Your blackberry IMEI number. Of course if it is lost you can look at the wrap or dashboard blackberry box. IMEI numbers are usually listed therein. Visit the official website of Blackberry. 2. https://besc.webapps.blackberry.com/besc/dashboard Login or sign in with your blackberry. Do a search / searching with blackberry IMEI number you are missing. If you move right, is shown maps of the location where the smartphone blackberry you are at the moment. How to Track a Lost Blackberry (which is still active). Application called Blackberry Protect on Blackberry App World. This application is already on your blackberry smartphone automatically. Directly from PC / laptop. Display / Send Message. With this you can open and send a message to the thief who holds your phone. View Location. With a view you can see the location on a map digital current position where your smartphone is. Play Sound. This feature to activate the alarm sound on your blackberry. Lock Device. This feature allows us to lock the smartphone our blackberry. You can delete any important data that exist on blackberry your smartphone. I can present to you. May be useful. SMS on the Blackberry just 70 characters due to setting in the SMS Data Coding using UCS2 instead of 7-bit. , A simple solution to solve the problem SMS character just 70 not 160 is actually pretty easy and by replacing from UCS2 SMS Data Coding to 7-Bit. Go to the SMS menu or Text Messages, then press the Blackberry menu and select Option. Scrolling down junk you find Data Coding. Then the fox fromUCS2 to 7-Bit do not forget to save the settings that you created earlier. OTA downloading a file, usually done directly with the blackberry, but what if you want to download OTA files, but when you do browsing using the PC / Notebook? This actually is very easy if you are browsing using Mozilla, because Mozilla addon already available to "download OTA files"
ota you want to download files directly from your notebook? for those of you Blackberry users are upset because error523, caused by alt + THMN and there were crashes of a particular application. This problem is often found in some people using blackberries Jave. The solution is quite complicated, because backup data is difficult, even I could not. Because hangs directly connect with DM. -. Next and run the next step. today I will continue concerning the apps error that you often find on your blackberry, many people who already know about this, but more people who do not know. Perform a hard reset on the handheld: Shut down, remove the battery wait a few second... replace battery then see when happens when it starts. Run Application Loader to reload the operating system and applications onto the handheld. Note: If these tasks do not resolve the error, contact your service provider. Reduce the number of calendar appointments synchronized to your handheld. 1-In BlackBerry? Desktop Manager, double-click the Intellisync icon. Click Configure PIM. The Handheld Configuration window appears. 2-In the Handheld Applications list, select Calendar. 3-Click Configure > Advanced Settings. The Advanced Settings for Calendar window appears. If you click the Transfer only Future items option, only future calendar appointments will be synchronzied to your handheld. If you click the Transfer items within a range of Days option and enter date range in the fields provided, only the calendar appointments that scheduled within the date range will be synchronized to your handheld. 5-Click OK to save your changes and close the window. 7-In the Handheld Configuration window, ensure that the check box beside the Calendar application is selected, then click OK.
8-In the Intellisync window, ensure that the Synchronize PIM check box is selected, then click Synchronize Now. The number of calendar entries on your handheld is reduced. Run Application Loader to reload the operating system and applications onto your handheld.. Perform a hard reset on the handheld. -200 Application manager threw an uncaught exception. The application manager event thread threw an uncaught exception and so cannot continue running. -203 The application manager console process, usually the Home screen ribbon, has failed, like due to an uncaught exception. -102 Invalid code in file system. The .cod files in the handheld have been checked for modification and it has been determined that there is a problem with one or more .cod files. -104 An uncaught Java exception was thrown in the Java code and diagnosed by the JVM. Execution can be continued or the handheld can be attached to a debugger on a desktop through a serial or USB cable. The event log should contain the traceback of the thrown exception. -105 An OS file system API returned an error status for a certain operation. This can indicate a corrupt file system or an error in the JVM. -106 An error has been detected in the graphics system of the handheld. -107 - 108Internal JVM error. -110 Non-idle event downtime error. A problem has been detected in the accumulation of JVM down time that represents how long the JVM has been idle. This indicates an error in either the OS code or the JVM code. be careful with blackberry prices below market. if you're forced to buy the warranty distributors make sure the distributor is well supported with a service center with expertise in dealing with the BlackBerry from the Re-sellers are trustworthy. Why? Another problem if you buy a bb for prestige reasons and trends but to those that menjadikah bw as business needs, the damage will be felt on the body weight if not supported service professional services from vendors or from the distributor concerned. READ MORE - be careful with blackberry prices below market. * Bookmark / save the links from your favorite youtube videos. You have just bought a new Blackberry 9650, the problem is the whole phonebook or contact you at your old Blackberry 8310. Then how to transfer contacts from blackberry phonebook or new to the old blackberry or other mobile phone? The easiest way is to copy the phonebook to the SIM card, but of course very limited way to remember the ability to store phonebook sim only a few hundred only, not got a thousand other than that if you have email at contact, sometimes can not tercopy to the simcard. The second alternative, is to use online services on the internet (eg Gmail) for synchronizing contacts. Online synchronization process is quite worth a try because of convenience and of course you can synchronize kapannya anywhere and most importantly affordable Internet access. Another alternative is to use Outlook in sync with the laptop, use the Device Swith on the Blackberry Desktop Manager Wizard. You must know the process Update / Upgrade your computer through the Blackberry OS, in which we live download the OS files to our computer, with an Application Loader and then we can direct the process of our Blackberry Operating System Update. In this way, for some people it is quite complicated. Though there is a fairly easy way to do Process Update your Blackberry directly, without requiring the help of computers, namely the process update the OTA (Over The Air). To get to the menu Option> Advanced Options> Wireless Update. When an update is available for your blackberry, icon will appear to perform the update process. Such a process is quite easily done and certainly not too complicated. The time required may take up to 2 hours, so get ready for it to charge your Blackberry, so as not to run out of battery when the update process is underway. * Data Backup, with Lookout, you can perform backups of data (picture and contacts) on your Blackberry, and where and whenever you can restore it back up, even backing up you can access via a laptop. * Missing Device, your Blackberry is lost or forgotten stored where? Do not worry Lookout can help you, with the alarm feature and can even wipe the Blackberry you, so Blackberry data you will not be accessible to others. OS bb remove it at once .. then in any bw who enter in accordance with the handheld type of course. There is also a running friend blackberrians wipe with JL_CMDR before the OS upgrade (sometimes necessary, sometimes guns necessary). 4. Will be asked "This BlackBerry ™ lock with a password? JL_Cmder stands is JavaLoader Commander. JavaLoader is a command line tool imaginable on the BlackBerry. JL_Cmder simplify the use of perintah2 (commands) that are often used in JavaLoader. 1. deviceinfo - handheld displays info. 2. eventlog - handheld displays the event log. 5. resettofactory - Eliminate IT Policy. (OS 4.3 + required).